Monogrammed Shower Curtain From Jane . 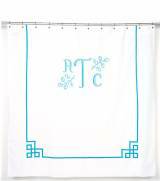 . .
Matouk Monogrammed Shower Curtain In White . 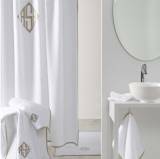 . .
Matouk Monogrammed Enzo Shower Curtain 100 . . . The Pink Monogram knows how to do those large Monogrammed Shower Curtains the correct way!! 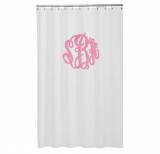 We will do a nice large 12 by 12 inch monogram on any shower curtain from our store. We will not send you one done in one of those smaller monogram styles. Large, bold monograms are embroidered on our shower curtains. Choose from several different styles. We are always adding more choices. The Pink Monogram has several machines that can handle embroidery of this size and a great artist that can enlarge any of our monograms to the 12 by 12 size that looks the best on a shower curtain. These shower curtains take several hours to sew out and they are worth the investment and wait. Monogramming can be done in about 3 weeks if items are in stock. Beautiful! !